This design is for bold men who want to make a statement with their hair and are not afraid to go to extreme lengths to achieve this. Long and flat middle hairs are dyed in all colors of the rainbow while the sides are skin shaved but with a "K" design shaved to complement the design. It's an incredible cut especially for men who love the colorful hair types. Going out of the norm with a little creativity always makes a great hairstyle or, at least, a unique one, and this is a positive thing. In this cut, extra long hair is maintained and styled straight to give it very high look. Sides are also skin shaved to ensure that all the attention remains at the Mohawk. One shortcoming of this dramatic style is that it will be quite difficult to maintain. Wearing these hairstyles is always about making a statement, and so this particular one will do exactly that. It is a great cut for men who want to look polished but still edgy. It is also very easy to wear and maintain because it does not keep a lot of hair. The most important thing, however, is to use a good hold product on the hair. 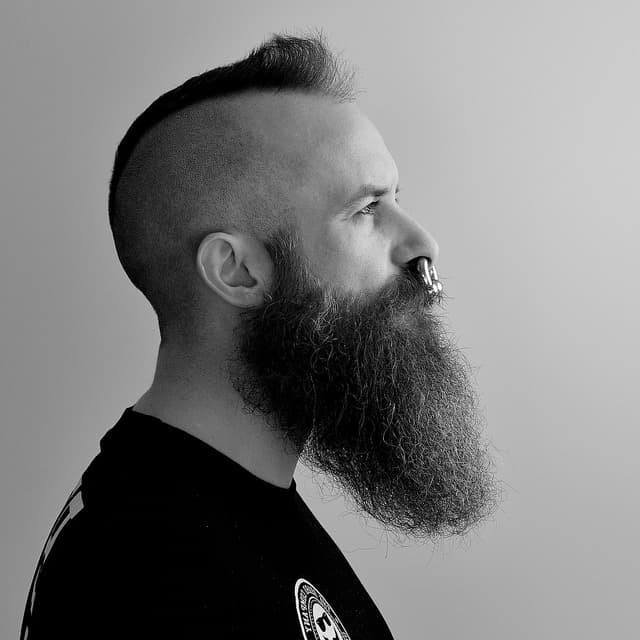 A beard in this cut will probably steal all the attention as it is full and longer than what is on the head but this does not make a haircut least attractive. 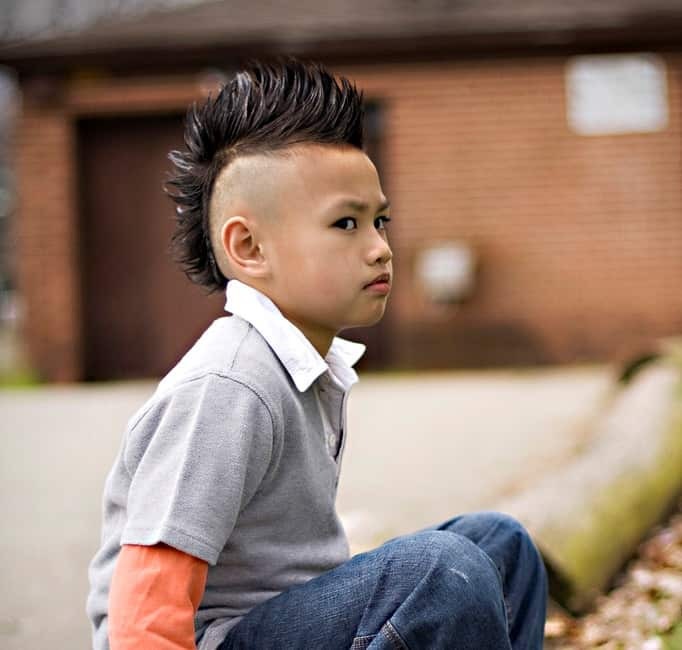 Short Mohawks are probably the most popular as they make both casual and formal wear. This cut adds some twist by leaving a slightly longer front that is then upswept to finish a fantastic look. Spiky hair looks great in almost any design, and this cut proves it. It is an ordinary hawk in all aspects starting with size, design and method of shaving but what makes it unique is the spikes. Spiky Hawk can look great with any man, but it is important to remember to use some quality hold product on the spikes. 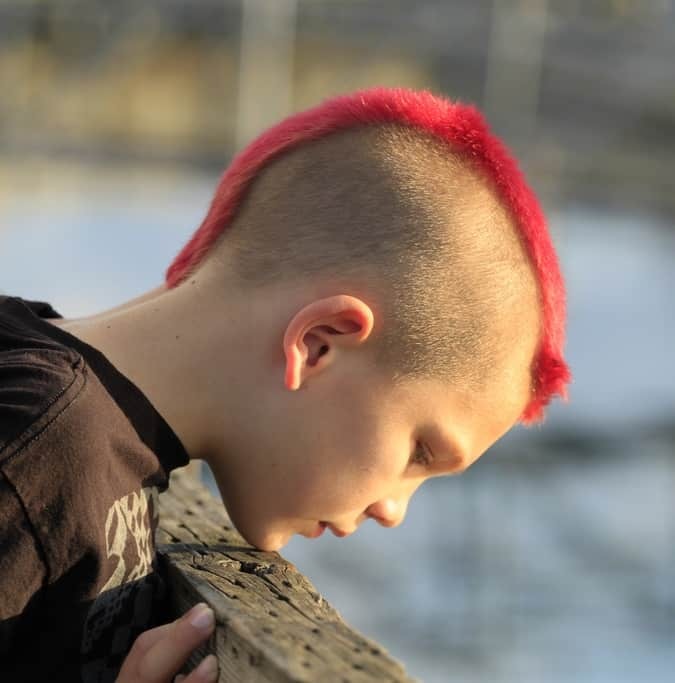 Although this is a conventional Mohawk design what makes it special and also unique is the choice of color. Red is a rare hair color as men shy away from it due to its bright appearance but in this particular look, it breathes much-needed life to what would have been a simple design. For this style, you can experiment with any bright color you wish, but red seems to look particularly more charming. Three things combine perfectly to make this hawk design stand out. First the long and thick spikes make it a firm Mohawk and secondly the blonde color makes it brighter and more detailed. The third thing is the product used on the hair as it makes spikes remain perfectly in place. Volume and texture of these curls are all that is needed to make it a great haircut and apart from the cut there is virtually nothing that you need to do. For this, the sides should be skin shaved while the center hair should be scissor trimmed to give the curls some uniformity. This style is as good as they get and everything seems to be done perfectly with the scissor cut wavy hair. Apart from it, styling is also perfect as the hair is divided into two sections at the crown with half of it being pushed back and the other half swept forward. This particular one is an original and adorable Mohawk for men with thick or voluminous locks. There is way much more hair in this design than what you would find in other variations of the style, and it is more of a faux since the sides are not skin shaved. The messy styling of the hair also adds some nice twist. Length of the strip of hair is the most important thing for a hairstyle and getting it right is the only way to look gorgeous in this cut. To get the front sweep hawk right, the strands should be trimmed to anything between two and three inches so that it can slightly cover a forehead when swept forward. Sides should be skin shaved just like in the other variations. Fanned Mohawks are dramatic but still very cute, and they involve leaving a few inches longer hair strip than what you would in other designs. For this look the fanned section is blonde is styled into some exquisite thick spikes. Hair products are then used to give them an excellent hold and firmness. One of the main characteristics of these hairstyles is skin shaved sides, but this particular one does things different as it instead has a skin fade. The strip left in the middle is feathered to give it a softer look that will make the wearer stand out from the crowd. As the name suggests, this haircut is smaller than the traditional ones, and it is also shorter than most. The strip of hair left should be about one and a half inch wide and an inch long. It is a style that is best suited for men who do not like extraordinary or fancy designs but would still want to stand out with something less dramatic. Sides should be skin shaved to make the design more visible and clean shaved facial hairs also go well with this. The extra high hawk in this style is spiced up by two distinct colors. Hairs are divided into two portions, and one is dyed blonde while the other is dark black. To complement this look the face is also made into two sections by painting half of it. Although this would be a great hairstyle to wear for Halloween, you can also try it out sometimes for a casual event if you are bold enough. Short spikes in this hairdo are amazing, and apart from their size, the other things that make them look great are color and styling. Black makes an incredible hair color especially when it is dark as in this hawk. Rather than being styled upwards like in most spiky designs the hairs at the back are slicked back for a fantastic look. There are many ways you can do spikes on your hair, but this one is perhaps one of the unique. It maintains some uniquely shaped peaks that are as a result of a right choice of hold product and skilled barber work. However, keeping this cut will be quite tricky, and you may need to visit your hair stylist regularly to make sure that you get to keep your tall spikes for longer. Top knots almost look like a man bun but what makes them different is how the hair is folded. In this cut, longer crown hairs are pulled together into a top knot while the back and sides are faded and a hard part created on the side. The deep side line goes all the way to the back where it becomes a part of an incredible back design. Although Mohawk design in this haircut looks classic, a color of the hair also plays a significant role in creating the fantastic look. The cut starts with a long flat hair at the top of the head that is then blow dried to give it some height. Sides and back are cut short but not too short to expose the scalp. For men with naturally blonde hair the cut is all that they need to wear it but for those with different colors, it will be necessary to do a dye job to get the look. This hairstyle is a fantastic option for men who like to keep afro hair as it allows them to get a hawk without having to lose their long hair entirely. Here the sides are skin shaved or reduced with a high fade while the afro is maintained at the middle strip. The afro can be trimmed or left as it is and you can spice it up by dying half of it blonde or brown. Villain looks are very popular nowadays, and they have now become conventional. This style demonstrates how to pull the perfect villain look with a full well-kept beard and a nicely done spiky Mohawk. What makes it look more villain is how the spiky hawk hairs are cut and styled to have unequal heights. A generous amount of hold product is used on the hair to make the spikes stand tall. Curly hair is amazing by all definitions and it also offers versatility as you can create almost any look you wish with your natural locks. In this style, the medium length curls are left at the middle section and are equal in length from the front to the back of the head. And unlike in other styles, the sides are not shaved completely but are instead scissor trimmed to slightly about half an inch in length. You can take things a little further with your curly cut by giving it a bright color. The thick curls are maintained in the middle section but make sure that you leave plenty of hair so that it can look voluminous when styled. A good color choice is the only other thing that you should be keen with for an eye-catching finish. Red is a perfect color idea for this style, but you can use any other bright color that you like. Color makes hair beautiful, but you have to choose the right one and dye the hair creatively. The blue highlight on this side swept design is a perfect example of it. Here long crown locks are maintained while the rest of the head is skin shaved and the locks given some beautiful blue highlights. Some smoothening product used before side sweeping to complete a fabulous look. Green is one of the most popular colors for everything starting from clothing to accessories, and it can also make a beautiful color for your hair if you choose the right shade. In this hairstyle, it brings out the best of a rather simple or ordinary Mohawk. However, hair is also cropped well, and it has some lovely texture that makes the color look more outstanding than in other green colored hairstyles. Most people prefer to style up their hair to give them some extra height, leave it as it is or slick it back for a unique look. However, you can also try this one that brings the hair forward to cover an inch or more of the forehead. Apart from the forward sweep, everything else is similar to the traditional one. Wavy bangs that are medium length look great when part of any hairstyle and this particular one demonstrates it. The bangs are nicely cut to medium length from the front to the crown while sides are faded. Some beautiful color job is done on the bangs, after that they are styled forward. The skin shave in this cut is probably meant to show off the fabulous head tattoos, but it is still essential to get things right if you want to replicate it. A thin spike strip is left in the middle, and it should be about three inches long to give some nice height when styled. Some color will also add a nice touch to this haircut. Fancy mullet is a kind of Mohawk haircut that demonstrates the versatility of these hairstyles. In this do, there are two sections with almost distinct looks. The top hairs are styled into a couple of spiky locks whereas the back hair (from the crown onwards) is left wavy and messy but still maintains the same height as the top. Young boys have a soft and healthy hair that can look good in almost any style and so if you have a son you can experiment with this cut, and you will be amazed by how he looks. For this design you should let their hair grow as lengthy as possible then scissor cuts it to about three inches or longer if you wish. You should then give them the hawk by skin shaving the sides and use some product on the remaining hair. It will look best on your boy if he has wavy hair. This hawk is very long and straight, and so it must have taken a lot of effort to get it right. Some skills and some good barbering tools are also essential because it is not very easy to make such a long hair that is not very thick to hold a diagonal position as this one. Apart from it, you should also shave everything else to an almost bald level, and you’re good to go. Upswept high Mohawk is a handsome style that looks best on men with a complicated style preference. To achieve the look, you should make sure that you have a couple of inches at the top, and sides are skin faded. You should then spray the longer top with a holding spray and comb it lightly till you achieve the upsweep you desire. Although the Clippers does an excellent job of cutting the hair, a comb does the magic concerning styling because it wouldn't look as good were it not brushed properly. Apart from this, the razor shaved patterns on the side also add an elegant touch and make the cut look even more stylish. Contrary to what most people think pink does not only look good on female hair despite its feminine nature. This style proves that provided you use the color creatively it can make your cut look outstanding. In this do pink is only used on the nicely done hawk while the sides are left in their natural color. The beard is also given a different color to create a beautiful contrast. This hair is very long and voluminous, and the wearer simply shaved the sides of his very long hair then blow dried it to wear this look. However, he does not stop at this as he also cuts some nice designs on the sides for an incredible and unique look. 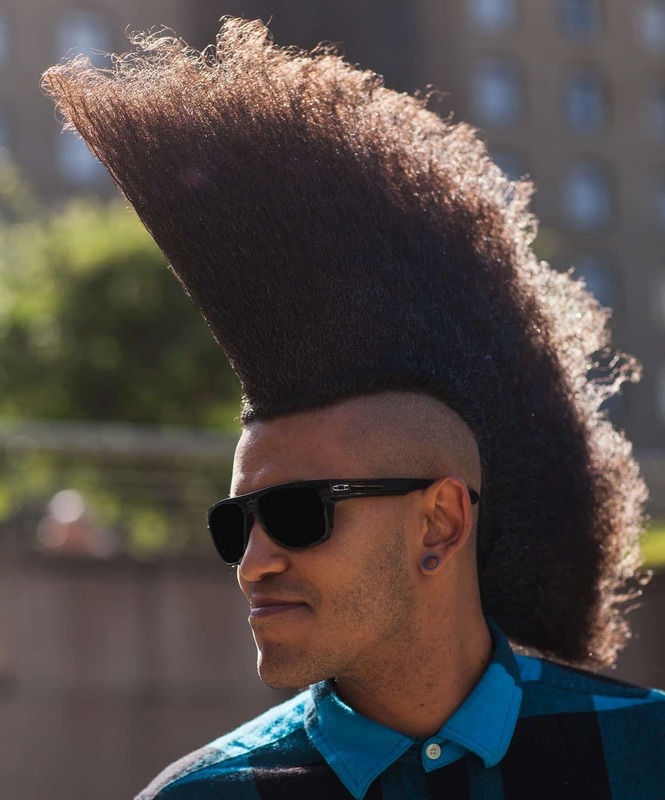 A Frohawk is a combination of an afro and a Mohawk, and it makes an amazing hairstyle like in this look. However, several other things make this one an excellent option for your hair with the main among them being the perfect texture and color. To add some twist to the already fabulous haircut, a small lock with the same lovely texture and color is left on one side. You do not always have to overdo things to look splendid as you can still stand out with a simple hairstyle like this one. What makes it cool is that it is a distinct look that only involves shaving the sides and leaving a strip of your natural hair in the middle. The cut is natural and there is no evidence of any styling except a minor side sweeping. This hairstyle is created with almost no cut at all but just by looking at you wouldn't know this. However, some products need to be applied in a generous quantity. After this, the hairs at the middle of the head are styled into thick spikes while those on the sides are slicked towards the center. Slicking the hair helps to create the short sides effect that is essential in the creation of a Mohawk. It looks exactly like the name suggests and it is quite a common type that comes in different colors and shapes but with the same theme. Here length is everything since the same look cannot be achieved with short hairs. The color combination is also crucial and in this particular one the wearer decides to go with gold and a shade of brown at the top most part. Sometimes you have to be bold enough and combine two distinct hairs to stand out from the crowd, for example, the classic mullet and dreadlocks. The locks are at the top and folded in a circular pattern to create a crown while a traditional mullet is created at the back. Sides are then given a gentle fade to finish the look. This is a short afro-hawk that is best suited for African Americans due to their dense ethnic hair. It's a good way to add a spin to this traditional style and the sides should be buzzed or skin shaved for a more traditional look. Use some quality oils and cream to design the middle. Feminine colors like pink also look beautiful on men's hair and they are quite attractive since they are a break from the traditional ones. In this cut two colors combine perfectly and although this is probably what will catch the attention of most people the wavy hair also plays a significant role in creating the eye-catching appearance. Some men have a nice hairline that forms a "V" shape at the front, and this is an added advantage when it comes to getting the hawk. Things are even better if the hair is curly as it will look perfect when made into a small hawk. For this cut, all you need to do is to leave a short curly hair in the middle ant taper the sides. Mohawks suit almost all face shapes and hair types and so they are a perfect option for any man who is not sure what to wear to stand out from the crowd. If done neatly and with a proper length they can even be worn for a formal look as they are pretty decent. From the 45 types above there is a Mohawk haircut for everyone and so you only need to choose one that you think will best suit you or try a couple of them to find the best.